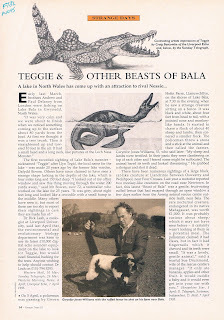 Having seen Nick Redfern's recent interesting article on the Lake Bala Monster, it brought to my mind an article I had on the creature from years back plus some recent thoughts I had on the phenomenon. The article is from issue 82 of the Fortean Times dated August 1995 and is shown below with the relevant text. There is also a big cat article which may be of interest to some. Early last March, brothers Andrew and Paul Delaney from London were fishing on Lake Bala in Gwynedd, North Wales. "It was very calm and we were about to finish when we noticed something coming up to the surface about 80 yards from the boat. At first we thought it was a tree trunk. Then it straightened up and towered 10 feet in the air. It had a small head and a long neck, like'pictures of the Loch Ness Monster." 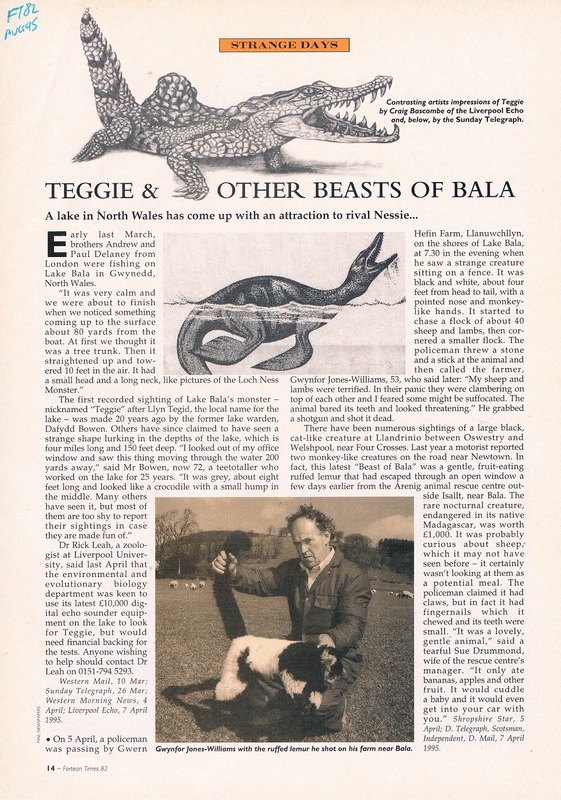 The first recorded sighting of Lake Bala's monster - nicknamed "Teggie" after Llyn Tegid, the local name for the lake - was made 20 years ago by the former lake warden, Dafydd Bowen. Others have since claimed to have seen a strange shape lurking in the depths of the lake, which is 4 four miles long and 150 feet deep. "I looked out of my office 1 window and saw this thing moving through the water 200 yards away," said Mr Bowen, now 72, a teetotaller who worked on the lake for 25 years. "It was grey, about eight feet long and looked like a crocodile with a small hump in the middle. Many others have seen it, but most of them are too shy to report their sightings in case they are made fun of." Dr Rick Leah, a zoologist at Liverpool University, said last April that the environmental and evolutionary biology department was keen to use its latest £10,000 digital echo sounder equipment on the lake to look for Teggie, but would need financial backing for the tests. Nick's article about a possible 10 foot pike does in fact make some sense looking at the sketch at the top done by Craig Boscombe. After all, a crocodile head is not too dissimilar to that of a pike. Having said that, the Delaney brothers' account is distinctly more in line with the traditional long neck ascribed to lake cryptids. Now, I was actually in North Wales for a holiday back in July but time forbade me paying a visit to Llyn Tegid. However, I had taken a look at the map at the time and was struck by something that may or may not be a coincidence. Take a look at the map below. Lake Bala is seen to the top right and to the left you will see Barmouth Bay. Seasoned lake monster fans will know that Barmouth also has the reputation for sightings of sea serpents. This article gives various dates for some possible cryptid encounters in that area. Could the two mysterious creatures be connected in some way? Certainly, at four miles long, the lake does not seem a sustainable place for one or more large creatures and so perhaps the Lake Bala Monster was once the Barmouth Bay Monster? There is probably some river route amongst the complex of rivers and streams that gets you from the sea to the lake, but it looks like a fifteen mile swim, so it is hardly a trip that would be undertaken regularly. Nevertheless, perhaps some food for thought. I think there would not be an unbroken water route, but it should be possible with overland stretches of a few hundred yards at most. An eight-foot crocodile, even a humped one, should be capable of that. The question is, how would it know the way? Yes, it is not easy and Lake Bala is several hundred feet above sea level. Frank opinion on this one is why not? It's remote, it's a large body of water. I think it's a real possibility. The descriptions are detailed and convincing. Even if it's an out of place or disproportionately large known animal it's very interesting. Reptiles need warm water to grow and flourish. Having said that we can rule out Nessie being a reptile. i don't think we know everything there is to know about "reptiles". I agree with John. I'm sure I've read elsewhere on this website about the low temperature tolerance of some reptiles being rather better than is widely assumed. The Alpine Newt, though an amphibian, is an example of an exotherm in cold conditions. Note also that heat retention ability increase with size. There is at least one other report of a 'Nessie' type creature in the lake. I recall quite a detailed report in the local press (would have been either the Wrexham Evening Leader or welsh language paper ' Y Cymro ') might have been towards the end of the eighties. Quite a large group of locals claimed to have seen a raised long neck and small head. I paid little attention to it at the time as it smacked of a publicity stunt by local businesses but it is interesting in view of the similarities with the Delaney 'sighting'. Olrik..... I doubt it "but maybe the animal observed in Lake Bala is a different species entirely"
I'm sure unknown species will be discovered (Nessie) in the future and also in our deep seas, but lake Bala? I'll not raise my bets. These sightings suffer from the same problem that haunts Loch Ness - inconsistency. How likely is it that an eight-feet-long beast would tower ten feet in the air, or that a crocodile-like beast would show a long neck and a small head? Well, whoever heard of more 5han one animal inhabiting a lake? Whoever heard of two different large unknown species inhabiting a lake in a tourist area, at least one of them looking like an air-breather,and being sighted so seldom? I think we sadly live in an age where people think there's nothing left to be discovered. When reports feature an inconsistency or two, that's enough for many people to dismiss them without further thought. I think many recollections of events of all types feature inconsistencies. But that doesn't necessarily mean the events didn't happen. When events are quick and awe-inspiring we can accept a bit of inconsistency. Did you make mention of them on another page? Where is the Council pond in question? This is interesting because it's proof of reptile survival through harsh UK winters. I have just googled it and yes it seems Roy is right. I take it he means any council pond that people could have thrown their overgrown unwanted pets in. I take it too they are living in allsorts of ponds and lakes up and down the country and not just council ones.The only question is wether they breed or not, but yes it does proove that these little reptiles can survive the cold. Its a very interesting point made. Hi GEZZA. I'd like to hear ROY's reply from himself rather than make assumptions. He may have been referring to a specific council pond. He seems to say he's mentioned council pond terrapins on the website before but I can't find reference to it anywhere. It's certainly an intriguing subject. Makes me reassess what I'd previously thought about reptiles and cold environments! ROY, I would love to see your response. Thanks! Hi Will. Sorry i just took what he put ' look no further than your council pond' to thinking he meant any council pond . I did google it and it seems the terrapins are in ponds and lakes all over the UK and causing a bit of havoc too.I have to say im suprised they have survived in the cold and i find it quite amazing. 'Council pond' is a very specific and unusual phrase though. Quite honestly I've only seen it written on this website. Hopefully ROY will solve this one for us, GEZZA. Yes Will , perhaps he means ponds owned by the local council. The ones i have read up on are actually boating lakes and canals, it seems they are living happily in a few of these in the UK.Im suprised they have survived though, but life is full of suprises. I think Bala drains North East via the Dee to the Wirral, so I doubt there's a contiguous stretch of water down to Barmouth? As for reptiles in cold water though - I've seen terrapins in the Leeds Liverpool canal which freezes over most years, frogs, newts and toads all seem to survive frozen winters (amphibians I know but still cold blooded) and fish - they're also cold blooded? I found various newts in my scottish back garden recently. Those ectotherms seem to survive the winter. I think they may burrow underground. Not sure if they cab hibernate. This opens up a world of possibilities. The concept of Loch Ness being too cold for reptiles doesn't seem to stand up to scrutiny. ROY, I'm doing very specific research on the Loch Ness animals, and one thing I am extremely interested in is the possibility of an animal like a terrapin surviving harsh British winters outdoors. Would you mind posting the exact location of the council pond you're talking about? It won't be possible to link a pond back to you if you wish to remain anonymous on this website. Once I have the location of the pond where you've seen this phenomenon I'm going to drive there and perform some research. It seems from what you've said that the terrapins are no secret to the locals, and I won't be putting any of them at risk. Thank you! Amazing Roy that they survive our cold winters. I suppose its right we can say it is not impssible for reptiles to live in Loch ness.